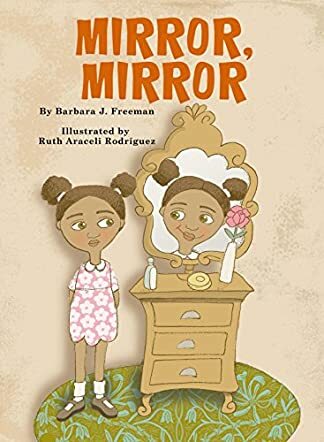 Mirror, Mirror by Barbara Freeman is a children’s book suitable for young children of grade second onwards. Mirror, Mirror is a story about a young black child named Tina Thomas who lives in Omaha with her parents and sisters. Tina is sometimes sad about her brown skin and curly black hair and how she looks. One day, as she is sitting in front of her mirror, the mirror suddenly asks her who is the prettiest girl she knows. Tina pauses and thinks that celebrities with blond hair and blue eyes must be pretty so that is what she answers. The mirror replies, “Wrong answer,” and that he will ask again later. In the meantime, Tina goes out bike riding and has a fall and her neighbors help her up. They tell her she is their favorite child in the neighborhood because she is always kind and helpful to people. One of them is also a Black History teacher and educates Tina more on the history of slavery and what it meant for African Americans, and brave black people such as Harriet Tubman, Madam C.J. Walker, and Mrs. Clara Luper who fought for what’s right. Hearing and understanding black history, Tina feels proud of her heritage and next time the mirror asks her who is the prettiest girl of all, she answers differently and means it. Mirror, Mirror by Barbara Freeman is a book meant to serve a lesson that beauty is not just superficial. It is, in fact, more about what’s inside a person. Tina learns this herself and after becoming aware of her roots and brave ancestry, she rightly understands that she is proud of herself and her race, and that she is beautiful, kind, and strong. Barbara Freeman has written an engaging, sweet story that educates young children while also entertaining them. Tina is very relatable and most children will easily identify with her. The illustrations in the book complement the story very nicely and this is certainly a good book for young readers of all ages. My children loved this book. They very much needed to see a little girl that looked more like them in a book. The positive message of believing in yourself is huge. Strength, pride in who you are and the knowledge of being “like” other children was the best gift my children could have received. Great book, love the self awareness it brought to my kids. It makes me happy that this book discusses beauty is within a person and not about looks. The added history lesson is positive! I love this book!!!! More importantly my daughter loves “mirror mirror”!!! I teach her to be happy with herself and be proud of who she is and to not be afraid to be a little diffrent !!! Great book Barbra Freeman!!!! Keep writring!!!! We will be waiting !!!!! Barbara Freeman holds the readers’ attention with her descriptive and creative writing style. Looking forward to more from this author!! I enjoyed reading Mirror, Mirror by Barbara Freeman. This is a book that all girls could learn from, especially children who may suffer with self esteem . Barbara Freeman is an inspired writer by her empathy and understanding of young children. I absolutely enjoyed reading Mirror Mirror..... It took me away to a great place! It is super-creative and fun; yet, it contains an invaluable message about physical and inner beauty which is extremely important for today's youth! Barbara Freeman is very skilled in her writing and it is evident in Mirror Mirror! I’m so excited for this book! This book is definitely a good read and helps young black girls create a positive image when looking in the mirror!! !